Fuel Adapter Plate - Chardon, Ohio - Chardon Metal Products Co.
At Chardon Metal Products Co., we manufactured the fuel pump adapter highlighted here. 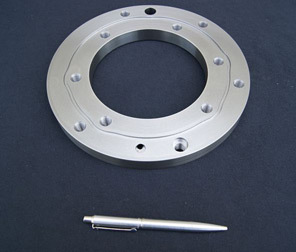 Designed to withstand the punishing conditions found in a locomotive diesel engine, this adapter plate had stringent quality requirements in terms of tolerances, finish, and cleanliness. With our 70+years of experience, we have the ability to manage projects like this that require a high degree of specialized handling. Material of construction for this 9.5" O.D. 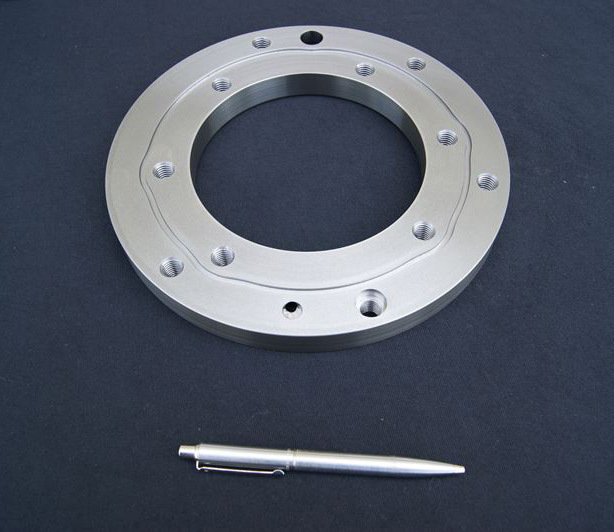 workpiece was specified as 80-55-06 ductile iron, which we sourced from a vendor we could rely on for consistent quality raw materials. Since this ductile iron is a high strength cast metal, there were several challenges for us to overcome when determining the best machining methods. In addition to developing tooling systems and cutting strategies that minimized the number of operations, we selected cutters that could power through material removal without excessive wear to help minimize cost. Having robust, multi-axis CNC lathes and mills that combined high power with extreme stability made the machining process more precise. We upheld tight ±.002" tolerances and a 6.3 Rz surface finish. Along with dimensional measurement and surface analysis, part cleaning played an important role in our quality efforts. We had to ensure surfaces were completely free of any dirt or particulate contamination prior to shipment to the customer. We prepared a Millipore test report, which analyzed and quantified the particulate to ensure the parts were cleaned to a 500-micron max particle level. If you are interested in learning more about this project, or if you have a part that has specialized requirements, contact us today.